SOF Level 2 exam dates have been announced. Practicing through the mock test papers will help in getting a good conceptual learning on the topics and syllabus for the Level 2 exams for Intern (IEO), National Science (NSO) and International Mathematics Olympiad (IMO). We provide best quality content which is created on the basis of previous years’ Level 2 exams. This will help students in getting an overview of the exam pattern and questions for each subject. Achieving success in any walk of life becomes a milestone and a cherished moment. It requires a rigorous and dedicated effort. Prepare with a focused approach and practice in a concise manner to achieve success in Olympiad Exams and become an Olympiad Champion. Level 2 Exams for SOF Olympiads (IEO, NSO, IMO) will be conducted on Saturday, 9th February and Sunday, 10th February 2019. The qualifiers’ list for Level 2 is shared along with the Olympiad results declaration. SOF Level 2 Olympiads will be held over 500 centers across the world. Details of the allocated centers of the qualified students will be shared by their respective schools at the end of January 2019. These are sent through courier to the respective schools. These are uploaded on the sofworld.org website by the first week of February 2019. These are e-mailed to respective schools. Students can use the admit cards which are issued to them for the Level 1 exams also. Students can write to SOF at [email protected] or [email protected] for the exam center address in February. Students can collect admit cards (in duplicate) through any of the above mentioned modes. Paste color passport size photographs on both copies and get them attested (signed and stamped) by school admins. Details of venue, time of the exam is mentioned on the admit card. Students need to carry both copies of admit cards to the exam center, where one copy will be retained by the center. Students qualified for the Level 2 Olympiad Exam must carry separate set of admit cards with them. Students without attested admit cards with photographs may not be allowed to appear in the Olympiad Exam. Roll numbers will be the same as allotted for the Level 1 Olympiad Exam for the students. Reporting time to the allocated exam center is at least 30 minutes before the exam starts. Students will be allowed entry in the exam hall 15 minutes before the start of the exam in order to give them enough time to settle down and fill their details in the OMR sheet accordingly. Late entry to the exam hall is not allowed after 10 minutes of the start of the exam. Additional time will not be given to the candidates coming late to the exam hall in order to complete the exam. Students cannot leave the exam hall till the exam is over and without the permission of the invigilator. Duration of the exam is 60 minutes. 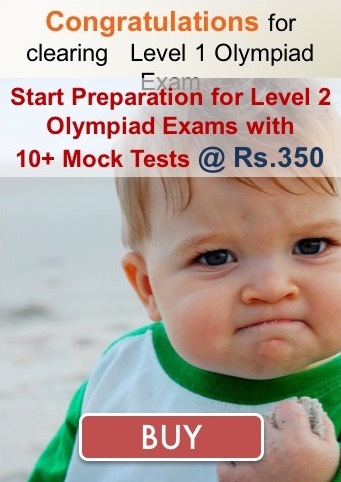 Level 2 Olympiad exams will be held for the students from classes 3 to 12, who qualify for it. 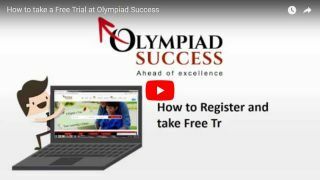 Olympiad exams will be pen and paper exams with multiple choice questions with no negative marking. Student qualifying for the Level 2 exam does not need to register again for the Level 2. Admit cards will be sent/shared as per admit card details mentioned above. For doing rough work students can use the question paper. In the exam hall student is not permitted to carry any textual material (written or printed), paper bits, calculator, mobile phone, any electronic device etc. There will be no provision of safekeeping of the personal belongings and students will have to make their own arrangements for it. Pen, Pencil and Admit Cards will only be permitted in the exam hall. Using unfair means in the examination will lead to disqualification and may be expelled from the examination center. In case unfair means is found after the exam is over, the result of the student(s) may not be declared and they will not be eligible for any award or certificate.